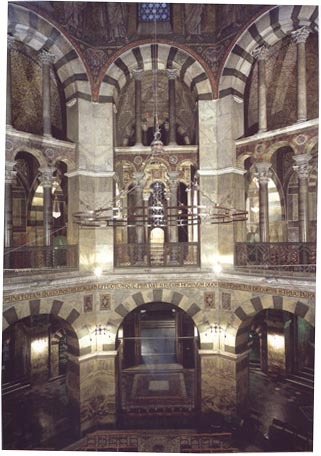 From that seat one could look down upon the altar of Mary and, looking across the centre of the octagon, one could see the altar of the Saviour in the eastern choir. Master and servants were strictly separated; so much so that even Mary, the Lord's servant, had to have her altar below that of her Son. One might even wonder whether it was more than accident that her altar was below the royal seat. 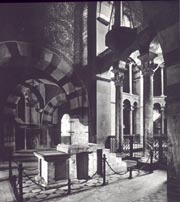 We must avoid rash conclusions because, although the altar of the Saviour and the royal seat were on the same level, the one was in the east and the other in the west end of the building. 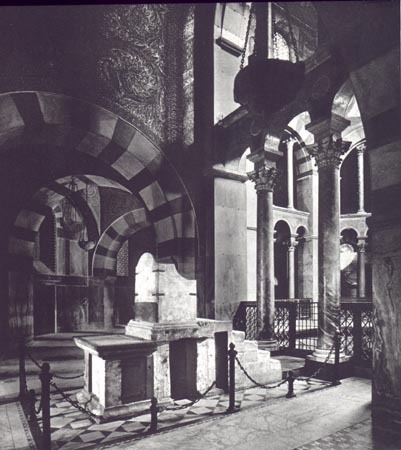 In the symbolism of ecclesiastical architecture the contrast between east and west plays a decisive role, by separating the sacred east with the space for the altar from the western part, built like a stronghold and reserved for the faithful. 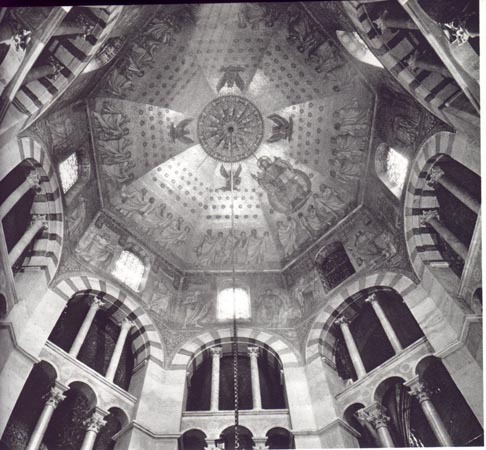 The inside of the cupola was covered with golden mosaics illustrating the fourth chapter of the Apocalypse. 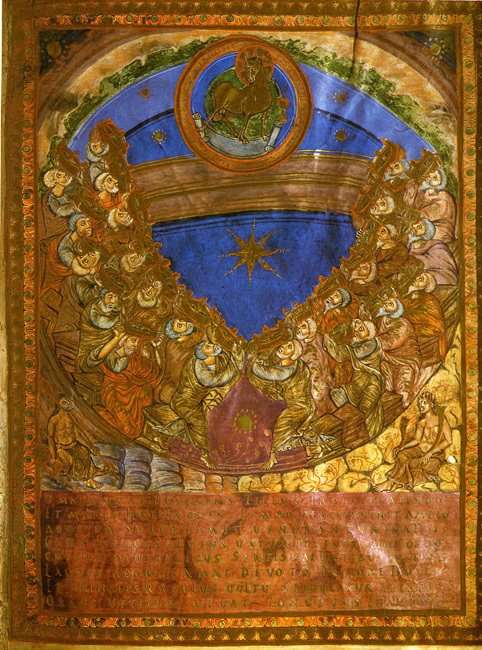 Christ was shown enthroned among the twenty-four elders and among the four symbols of the evangelists, the lion, the ox, the man, and the eagle. 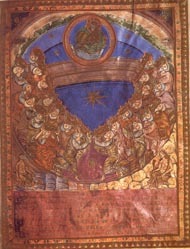 This was the first important representation of maiestas [majesty] on German soil. During the Romanesque period such representations were to become the dominant themes of pictorial and plastic art. The heavenly splendour of this sphere outshone the spectacle of earthly pomp offered on the middle floor by the gilded bronze railings and the polished pillars. From the ground floor the servants and the common people looked up to all this splendour, while they themselves stood among the plain pillars of ordinary stone.... 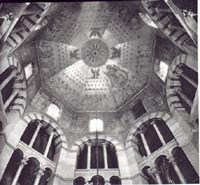 The palace chapel of Aix-la-Chapelle was the reflection of the great cosmic order of government. 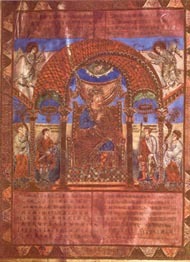 Charles the Bald Enthroned, from the Codex Aureus of St. Emmeram. The different spheres of the cosmic order, though clearly distinct, showed a similarity in structure. Any occurrence in one of the spheres produced an effect in all the others. If the ruler was angry there appeared threatening signs in the sky. Comets, downpours of blood or of stones, storms and floods signified discord, dissension and disturbance of the cosmic order. The devil was anxious to promote confusion in nature as well as in the hearts of men by inciting servants against their masters and the masters against the ruler. On the other hand, if everybody willingly accepted their status and the undisturbed exercise of royal authority under God and over men, the result would be victory for the royal armies, calm winds, fertility of both earth and women, and the health of the whole people. Such conditions meant that the world was well balanced and in a state of pax [peace]. The king's most important task was to achieve such peace and to maintain it. The ruler was appointed by the grace of God, by the favour of the real, heavenly Emperor, to govern his Christian subjects as his lieutenant. The right to judge and the power of the 'ban' formed the essence and the mark of all government. This power meant the right and duty to punish evil-doers, to issue orders to the law-abiding and to summon them to military service in the Christian army in the cause of order against all devilish attempts to sow dissension. We may well ask at this point whether the earthly emperor or king had received, from the hand of the heavenly ruler, not only his administrative, judicial, and military authority, but also the power of the sacred mysteries. 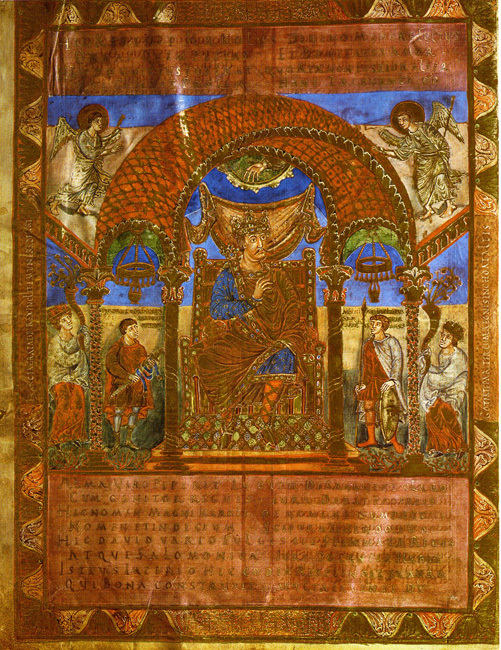 Was the earthly ruler, in the proper sense of the words, a rex et sacerdos, king and priest at the same time?